This is the start of Macaron Mania for me so bear with me as I post a series of macarons on our blog. Hope you are not sick of seeing macarons after this :p. Of all the macaron flavours that I made during this mania, I think that Earl grey salted caramel is the one that is most noteworthy. 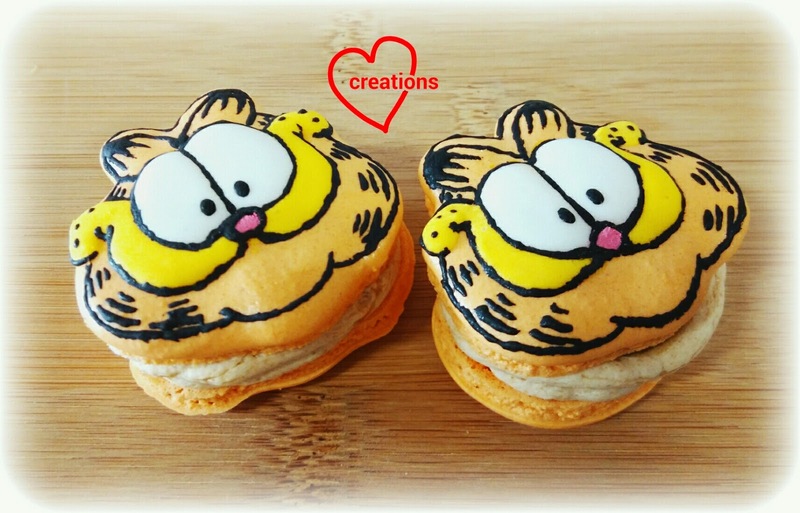 I made these Garfield macs specially for my kids who are fans of Garfield comics and love to eat any extra macarons that I have! A peek at the delectable filling! You may wonder why there are only two macarons. That's because I used the leftover batter to make these. 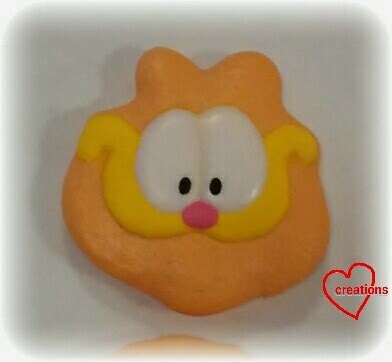 Someone requested for an assortment of macs for Peppa Pig and friends so I made Garfield with leftover batter from Candy Cat. Will post those awesome Peppa and friends macs in the near future and not clog up the assortment post with recipes of different flavours :). This is actually my second attempt at making earl grey salted caramel macarons. I made my first attempt last year, which was not as beautiful due to the lack of experience. For the best oomph in flavour, I would have added three teabags worth of earl grey tea leaves into the macaron batter. But that would cause the shells to have black specks (can you imagine speckled Garfield?) so I omitted it. Caramel flavouring was added to the batter for shells to enhance the caramel flavour, which I didn't add for my first attempt. 1. Sift together ground almond, icing sugar and earl grey tea leaves. Add 80g of egg whites and caramel essence and mix together to form a thick paste. Add orange colouring and mix well. 2. Place the other portion of egg whites in clean metal bowl and beat at medium low speed while heating up caster sugar and water in a small saucepan without stirring. Make sure that the egg whites are not beaten beyond the soft peak stage. Turn down the speed of the mixer as necessary. 3. When the temperature of the syrup reaches 115°C, the the saucepan off the heat, turn the mixer speed to high and slowly pour the syrup in, taking care to avoid the beaters. Keep beating at medium high speed for about 10 minutes or until the Italian meringue cools down (sometimes it takes 12 minutes). The meringue should be able to hold stiff peaks at this stage. 4. Fold the meringue into the mass in step 1 in three additions. 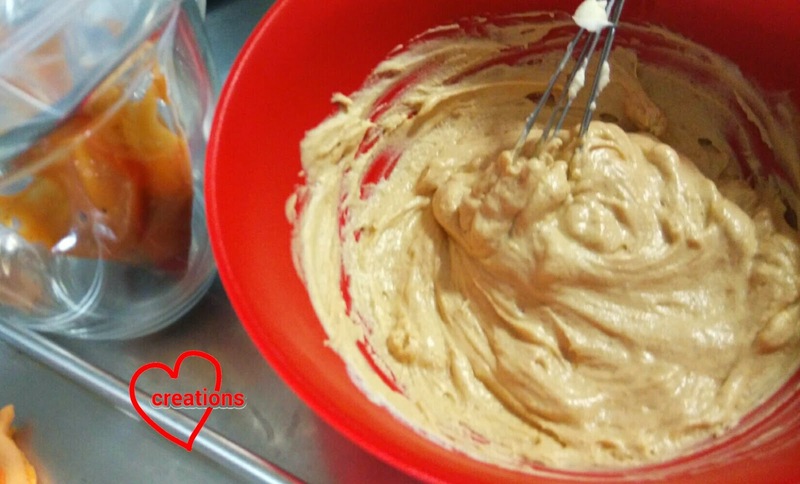 Keep folding and pressing the batter down with a spatula or wooden spoon until it flows slowly when bowl is tilted and falls off in continuous ribbon when you drop the batter from the spatula. Be careful not to overfold. 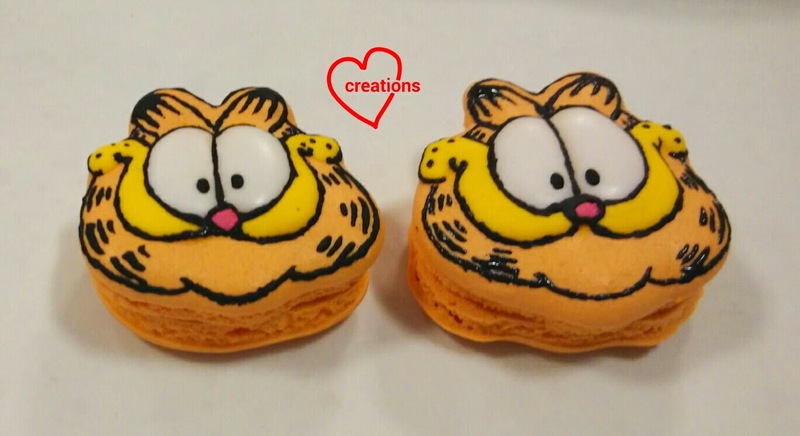 If you are making fancy macarons like Garfield, do underfold the batter a little, with the batter falling off the spatula in a slightly discontinuous way. Watch a video demo of this macaronage if you haven't already to have a better idea of the consistency of the batter. 5. Transfer batter into piping bag fitted with a 5-6mm round tip. 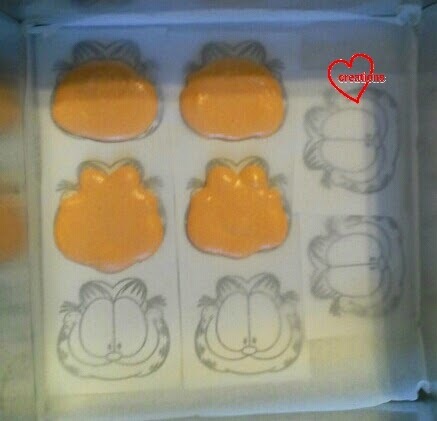 Pipe rounds or the shape of Garfield with the help of a template under the baking sheet. Pipe the ears with piping bag fitted with 2-3mm tip. 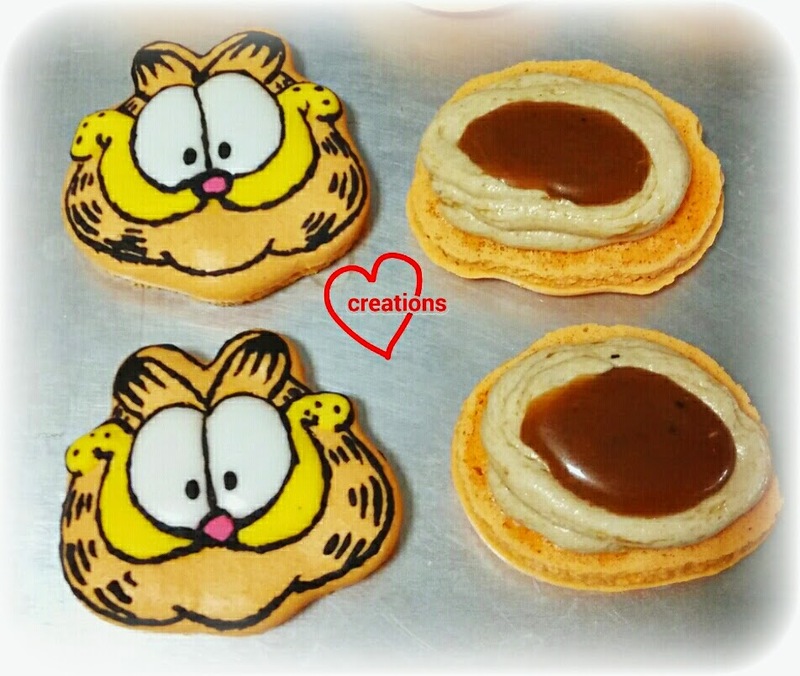 Use a toothpick to pull the batter whenever necessary to fit the Garfield shape. I was running out if extra batter so pardon the less than ideal piping. 6. Tap the tray a few times to release any trapped air bubbles. Dry the macaron shells in oven at 60°C fan mode or aircon room, depending on which method suits you best. If you only have a tray of macarons to bake, oven drying is great to speed up the process. If you have many trays and various flavours of macarons to bake, drying in air conditioned room may be better to slow down the drying process. As it was, mine stayed out for too long because I had to cook and take care of kids as well so it was a big challenge to manage many trays and flavours! 7. Bake the shells as soon as they are no longer tacky or sticky to touch at 130-140°C for 17-20 minutes with the rack at the second lowest position. Let the shells cool on baking tray for 5 minutes before removing. If they shells are still stuck to the baking sheet, return the tray to the oven and bake for a few minutes more. Store the shells in airtight container if you are not filling them yet. Decorate with royal icing. Please refer to this post for royal icing recipe. Much better! My little one said looking at these cheered him up! *Please refer to this recipe for Earl grey salted caramel recipe. You may use 2 teabags if you want a stronger tea flavour. **Please refer to this recipe for the basic smbc. Just omit Horlicks and water. Combine 110g of smbc with 90g of earl grey salted caramel to make 200g of cream. If the salted caramel is too thick, add a little milk to thin it before using or mixing with smbc. Earl grey salted caramel in the piping bag and smbc in the bowl. Yummy! Assemble the macarons as shown in the second picture of this post. Pipe a ring of smbc followed by filling the center with salted caramel. Refrigerate for a day before consuming. Let the macarons sit at room temperature for 5 minutes before eating. Enjoy! My kids really enjoyed these macarons!